When I first saw the trailer for Clint Eastwood’s American Sniper a few months ago, I immediately thought of “Nation’s Pride”, the movie within the movie Inglorious Basterds (2009) about a Nazi sniper who killed over one hundred allied soldiers from the top of a high tower. Then I thought to myself, “no way, this movie will be oozing with that much ridiculous nationalism”. Unfortunately, American Sniper is as jingoistic and silly as Quentin Tarantino’s fictitious film he devised as a plot device to lure Nazis such as Hitler and Goebbels into a movie theater to meet their demise. The film opens up in Iraq with deliberately muted colors. 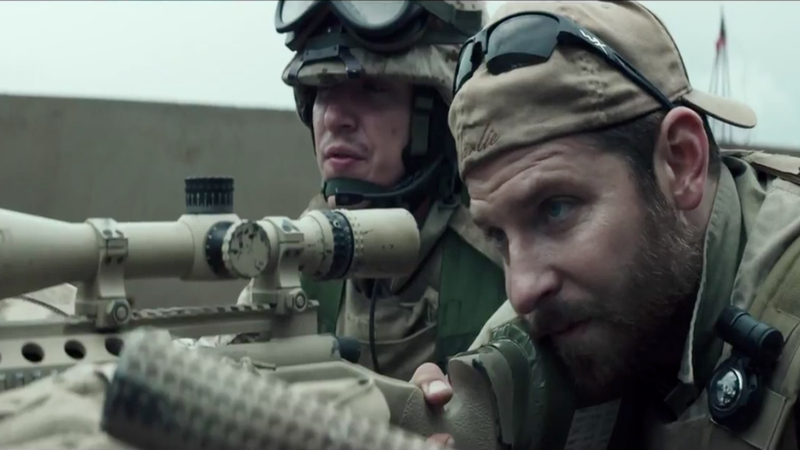 We see Bradley Cooper as real life war veteran Chris Kyle, hunched over his rifle and looking through the scope at a Muslim woman handing a boy what is most likely an explosive. It quickly cuts to a flashback with Kyle back in the United States before he joined the military. The cinematographer had a plan with his color scheme. He intended to make the scenes in Iraq look drab and colorless and all of the scenes in the United States, specifically Texas where Kyle is from, look colorful and vibrant. The red, white and blue really pop in this film. George W. Bush would love this movie. Early on after noticing the cinematography manipulation we see even more classic audience manipulation from the opening scenes with the music and sound effects orchestrating exactly how Eastwood wants his audience to feel. American Sniper has very heavy handed and manipulative direction, which is very uncharacteristic from other Clint Eastwood directed movies. In many of his other films he has little to practically no music in them to tug at your heart strings and just lets the acting and camera work speak for itself. His best films like Unforgiven (1992), Mystic River (2003), Million Dollar Baby (2004), Letters from Iwo Jima (2006) and Gran Torino (2008) all feature the same minimalist direction and are all very powerful dramas. This is a surprisingly dismal fact that a man who directed very thoughtful and emotional pictures is now basically using his talents on a Republican propaganda piece. Even more disappointing about American Sniper was that it did not add anything notable to the war genre. For a movie that has recently garnered so much praise and Academy Award nominations, it really is nothing special in terms of its own artistic merit. It has a lot of intense sniper scenes involving our hero saving US soldiers and killing Iraqi insurgents, however none of its scenes were as suspenseful as the sniper related moments in Kubrick’s Full Metal Jacket (1987) or the scenes involving Barry Pepper as a talented sniper in Spielberg’s Saving Private Ryan (1998). It fails even more on its own by trying to be ambivalent about the recent Iraq war, unlike The Hurt Locker (2009) which justifiably won the Best Picture Academy Award in part because it presented its hero and message as not anti-war, but not pro-war either, simply stating that “war is like a drug” and we see how that quote resonates all too well with the main character played by Jeremy Renner. 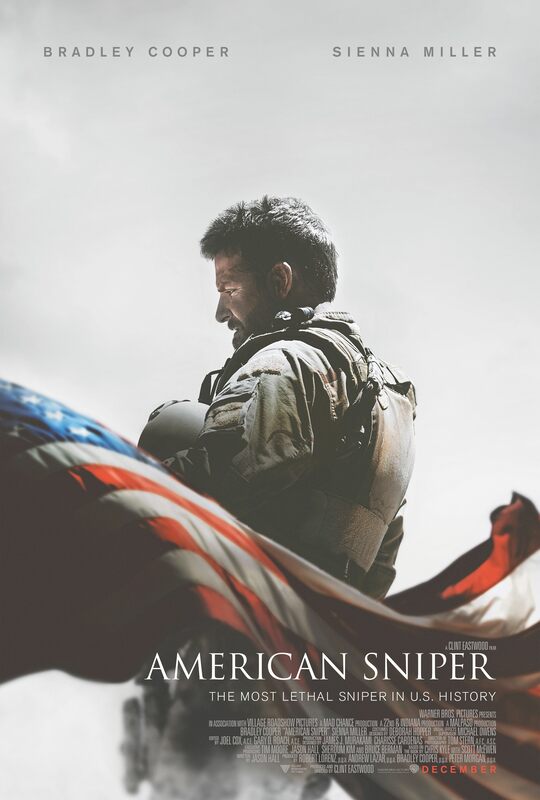 The harder American Sniper tries to be impartial about the war, the more it ends up being very nationalistic. Another major aspect of American Sniper that failed enormously when compared to The Hurt Locker was how it dealt with coming home from the war and soldiers going through PTSD (Post Traumatic Stress Disorder). It was inferior because it treated the audience as if we all have a clear lack of intelligence about the matter. There are so many superfluous scenes of Bradley Cooper, struggling with his family or discussing his time in country with other veterans where most of the audience probably understood the point after one or two scenes. Once again The Hurt Locker did it best. The scene where Jeremy Renner comes home and is standing in the supermarket looking at all of the cereal is all I need. That image spoke a thousand words and resonated with many veterans I have spoken to. Despite my disdain for the films message and direction, credit must be given to Bradley Cooper who does deliver a very good performance. Cooper was born in Philadelphia, lives in New York City and in American Sniper he never lets up his Texas accent. It’s a brutal and realistic recreation squandered in an over directed propaganda picture. American Sniper is a misguided and shameless war picture. It personally offended me during the scene where it showed the terrorist attacks on the World Trade Center. We all know what happened, there is no need to show Chris Kyle watch the 9/11 attacks to be inspired to get all gung ho about going to war. In the end American Sniper is a pro war celebration of redneck culture and nothing more. Click below to watch the trailer for Kathryn Bigelow’s The Hurt Locker. A film I admire and has only grown in terms of importance since it was released and won Academy Awards for Best Picture and Best Director, marking the first time a female won an Oscar for directing. Thanks for the very insightful review of American Sniper! We Americans can be “played” so easily by Hollywood. Thank God for free speech! Thought I wanted to go to see B Cooper’s performance but naw. I did see “The Hurt Locker” and I will take your word for it that that was the superior movie. Thanks for a well-balanced review. Also, Cooper is a graudate of Georgetown here in DC! Thanks for reading. Check out my article about Clint Eastwood’s duality, I’d love to hear what you and Rob think of that. I am not a fan of war movies but American Sniper was a true story and I found it interesting.